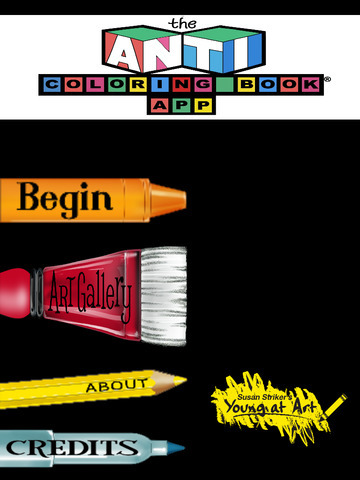 The Anti-colouring Book app is a unique concept by Susan Striker that steps away from the traditional colouring book pages and encourages the child to use their imagination and critical thinking skills rather than colour in a pre-conceived drawing. To create a new page press the begin menu. Here you are given over 40 anti-colouring page options to start your creative thinking from bogeyman to grandparents to magic carpets. We did note here however that several of the words used are American biased such as junkyard, backyard, bill board etc. Upon choosing your page the user can choose from a number of key art tools displayed on the right hand side. We feel that the app would have benefitted from a retractable art tool box that would allow the user more space for the page itself. Working on an iPad mini would confine the space even further. However, the tools are excellent and offer a wide range of brushes, pens and colour techniques. The menu system at the bottom of the page enables you to save the drawing, start again, listen to instructions (which is great), read a book (we are unsure of this one), save to the gallery and mix colours. The brushes are very receptive and offer some great ways to create your drawing, however this can be quite fiddly at times. The ability to step back a stage rather than delete as a whole or by using the eraser would be beneficial. We loved the paintbrush and how the colour is built up after each stroke. Once your masterpiece has been created it can be saved to the gallery or even emailed to the worldwide art gallery via email. Your saved design can be emailed but not printed directly from the app, which is a shame. 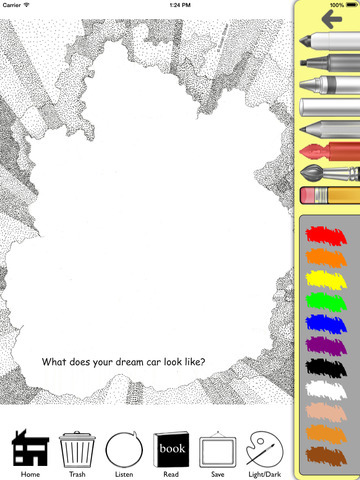 Overall we love the concept of the Anti-colouring app and how it will open young minds to creativity and imagination. It’s a great idea that will appeal to an audience of all ages where the possibilities are endless. Note: This app is supported on iPad 3 and above, and all iPad Minis. Incredible! 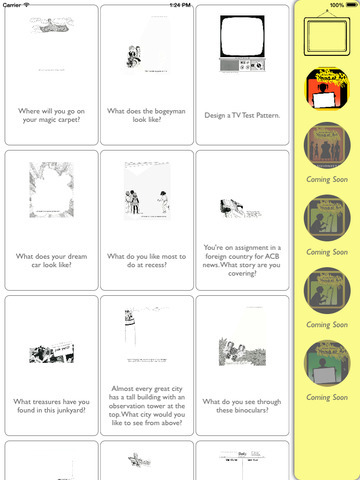 An app that encourages children to imagine, create, draw, think, plan, solve problems and read! No shooting, crushing or killing! All art projects stand-alone but also offer opportunities for enrichment by recommending a storybook about the same subject as the activity. For pre-readers, there is an option to listen to directions for each activity.